[Source: Arizona Republic] — As the [global] economic downturn grinds on, downtown Phoenix boosters have been anxiously watching sales at several new condo projects, including 44 Monroe at the intersection of Monroe St. and 1st Ave. City leaders want to revive downtown Phoenix, and getting more people to live there is a crucial part of that plan. Although 44 Monroe wrapped up construction this year, units have been slow to sell… According to Ryan Zeleznak, Grace Communities principal, of the 196 units in the 34-story building, 96 (49%) are in escrow and about a dozen (6%) have sold (including one for $1.55 million last week). [Source: Joel Kotkin, reprinted in Arizona Republic] — As the financial crisis takes down Wall Street, the regular folks on Main Street are biting their nails, watching the toxic tsunami head their way. But for all our nightmares of drowning in a sea of bad mortgages, foreclosed homes, and shrunken retirement plans, the truth is that the effects of this meltdown won’t be all bad in the long run. In one regard, it could offer our society a net positive: Forced into belt-tightening, Americans are likely to strengthen our family and community ties and to center our lives more closely on the places where we live. This trend toward what I call “the new localism” has been underway for some years, driven by changing demographics, new technologies, and rising energy prices. But the economic downturn will probably accelerate it as individuals and corporations look not to the global stage but closer to home, concentrating and congregating on the Main Streets where we choose to live -– in the suburbs, in urban neighborhoods, or in small towns. [Source: Paul Barnes, Neighborhood Coalition of Greater Phoenix] — In October and early November, the Neighborhood Coalition of Greater Phoenix began hearing rumors that as part of budget cuts, the City of Phoenix may eliminate Village Planning Committees as well as the entire Village System. These rumors were brought to the attention of Mayor Phil Gordon. Below are e-mail communiques from Mayor Gordon and City Manager Frank Fairbanks assuring the Coalition that regardless of whatever severe budget cuts might have to be initiated, the Village Planning Committees and Village System will be retained. Paul, while I have not heard nor was I aware of any rumors that the city, due to “budget cuts and perhaps for other reasons as well, Phoenix may eliminate the village planning committees as well as the village system,” I informed you that I “would not support either of such actions should they be formally recommended.” I am not only reaffirming that pledge, but am committing that I would aggressively oppose any such action, formal or informal. Please assure everyone that this won’t happen. However as we did discuss, substantial cuts will occur in all departments thus reducing service; increasing wait times; and delaying planning activities, meetings, and special projects in many cases. We did discuss that some village committees that form ad hoc or subcommittees may have to do without staff as the city may not be able to continue overtime salaries till the budget picture greatly improves. The village committees could seek through the full council, a waiver to a village subcommittee request for staff resources which if granted would then be allocated from the city’s general fund (thus taking away dollars from something else). However, let me again stress that no villages nor the system itself or any portions thereof will be eliminated. If anyone has any concerns, please have them contact me as I represent everyone in the city. The Mayor copied me, so let me add some information to this discussion. First; The City by State law must have a balanced budget. City revenues are declining and will not support the current level of activity. The City has no proposed cuts at this time. We have not identified what we will propose to balance the budget. I have not yet seen all of the options yet. Budget & Research is examining all the options in cooperation with the departments. “The City,” meaning the Mayor and City Council or City Management, has not yet proposed any cuts to the Village Planning process or anywhere else. Any cuts would be proposed on January 6, 2009. Second; About a month ago, each department head (Debra Stark in the case of Planning) was required to submit a list of what she would cut from their own department, IF their department were to be cut 30%. The Planning Department 30% list included cutting 4 of the 11 Village Planners as the worst case scenario. I am told that currently, 11 Planners staff 15 Village Planning Committees. If these 4 positions were cut, then 7 Village Planners would remain to staff the 15 Committees. Under this Planning Department submitted proposal, all Village Planning Committees would continue. If these cuts proceeded, Planning proposed that all Village Planning Committees would remain is operation, some lighter agenda meetings might be cancelled and the amount of fresh research would likely be reduced. Third; City revenues continue to decline. We have not hit bottom. We do not have a final estimate of the percentage cuts that will be necessary because the situation is still very fluid and we don’t need a final estimate until we propose cuts. The target cuts for all civilian general fund departments are between 25% and 45%. Because of massive community support, the Police and Fire Departments will have an increase in their budgets, but this increase will not be as much as their normal cost growth. Finally, let me add that city management also supports the village planning program and model and we have no interest in eliminating it or reducing this important part of our community. [Source: Catherine Reagor, Arizona Republic] — Metropolitan Phoenix’s ailing housing market is getting a boost from the federal government. Early next year, Arizona will receive $121 million to combat the state’s growing foreclosure problem. Most of the money must be spent to buy and fix up foreclosure homes and then help people purchase them. Homes in the Valley communities hardest hit by the downturn will be targeted. Those areas include neighborhoods in Phoenix, Mesa, Avondale, Tolleson, and Surprise. The money, distributed by the U.S. Department of Housing and Urban Affairs, comes from the nation’s Housing and Economic Recovery Act, which Congress passed in July. The funds are earmarked for “stabilizing” the neighborhoods hurt by too many foreclosures. The federal money will go toward the purchase of thousands of Valley foreclosure homes, which means more work for real-estate agents, appraisers, title agents and lenders. Many people who have struggled to get financing or down-payment money to buy a house will get help. The funds also will mean more jobs for contractors hired to fix up foreclosure homes. Homeowners in neighborhoods hurt by too many foreclosures should see their home values stabilize and even increase as the money is spent on houses nearby. Several ASU students are interested in organizing an ASU Downtown Phoenix Campus Chorale and Glee Club. The goal is (a) perfect harmony and (b) to go holiday caroling around the campus on Wednesday, December 10. Their first rehearsal of traditional holiday favorites and new music will be Thursday, December 4 from 4:30 to 6 p.m. in Room 286 of the University Center (411 Building). For more information, visit their Facebook page. Downtown Phoenix Partnership research indicates 29 new bars and restaurants opened between January and September, including Bar Smith, Sonoma Grill, Sens, and ZPizza, and eight others were under construction. The study also shows 14 restaurants closed during that period, including 101 Bistro and Circa 1900. An interesting map! Click on the map to enlarge. [Source: City of Phoenix] — The APS Electric Light Parade returns to the streets of uptown Phoenix for its 22nd straight year. 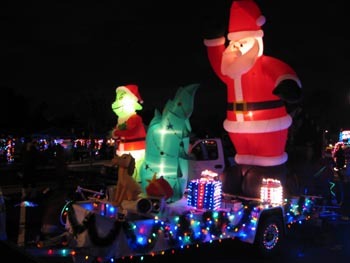 The 2008 parade, themed “Preserving a Family Holiday Tradition,” kicks off at 7 p.m. on Saturday, Dec. 6 on Central Avenue just south of Bethany Home Rd. Comprehensive parade information is available online in the APS Electric Light Parade link here. General information is available by phone at 602-534-FEST. This annual spectacle has attracted up to 200,000 spectators to the parade route. All entries in the parade –- even individuals in performance groups who walk the route –- are decorated in holiday lights. In years past, some entries have sported more than 50,000 lights. In addition to the floats, performance groups and bands also will take part. From just south of Bethany Home Road, the parade proceeds south on Central Avenue to Camelback Road, then heads east to 7th Street where it turns south to the end point north of Indian School Road. The parade is a rain or shine event. Keep an eye on weather forecasts and dress accordingly. Parking is on street and also is on a first-come-first-served basis. Private lots near the parade area often offer parking for a fee. 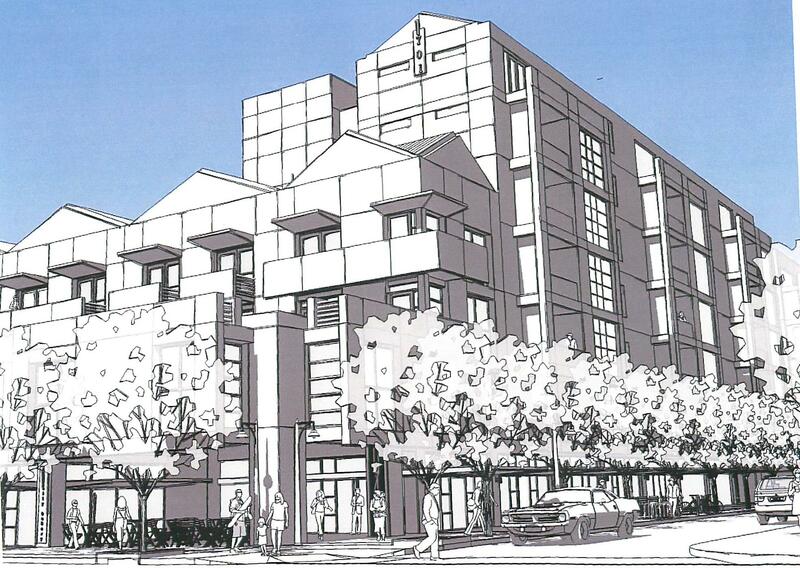 [Source: Tom Chauncey, Save Phoenix Homes] — The proposed PUD rezoning application for 7th Street and Earll (Z-119-07-4) has been withdrawn. Leadership of the coalition of single-family homeowners in the La Hacienda, Country Club, Coronado, Greater Cherry Lynn, Ashland Place, and Country Club Manor neighborhoods were just informed of the news by the developer’s attorneys. What do the dots represent? Click on the map to find out. [Source: Robert Booker, Arizona Commission on the Arts] — Phoenix Art Space is a new website promoting local Phoenix arts and culture, offering articles, videos, spotlight art, an art map, and a list of arts organizations. You can also view artwork by member artists.